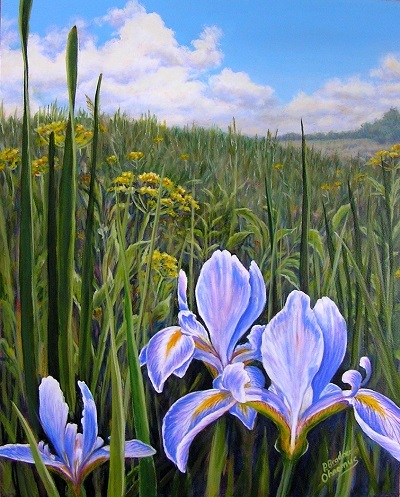 The artist shares, "I was born in Ashcroft, British Columbia, Canada and became a naturalized US citizen in 1999. I received my BA from the University of Northern Iowa in Art Education, where I was awarded a free tuition art scholarship for my last two years. I completed my MA from Western Illinois. I taught art in the Davenport School District from 1980-2013." "Our natural environment is a powerful focus of my artwork. Macro and microenvironments fill my paintings, engaging the viewer in their detail. Even while painting tranquil scenes, I achieve active color sensations by layering color over complementary underpaintings. The tall grass prairie is an irreplaceable tapestry of plant and animal life. I paint dynamic compositions of Midwest prairie remnants so that the viewer can appreciate and see the need for their maintenance before they are lost forever."